The Gen Ed Review Committee, whose members shared the report’s findings at the Faculty of Arts and Sciences meeting last week, found that the current Gen Ed program had too many requirements, unfocused courses, and lack of both faculty investment and financial and administrative support. 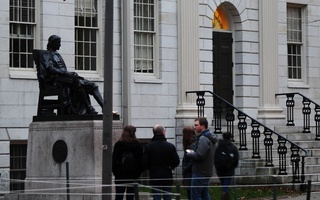 In interviews since the Faculty meeting, some professors praised the committee for writing what they described as a blunt report and said the critiques of Gen Ed are part of a broader discussion about how Harvard could better educate its undergraduates. At the meeting, faculty members voiced their concerns about the Gen Ed program, echoing the interim report’s findings. While some focused specifically on the need for better taught and more focused Gen Ed courses and others discussed problems with counting departmental courses for Gen Ed credit, professors on the whole critiqued the current program. “Everyone seemed to agree that the program is broken and needs fixing,” Comparative Literature Department chair David Damrosch said. Those conversations, faculty members say, have continued since the meeting—and they have broadened to a more general discussion about ways that undergraduate education at Harvard could improve. “[The Faculty meeting was] obviously the first step of what’s going to be a long discussion, to be carried out next year,” Hall said. The discussions include a variety of aspects of undergraduate education. In particular, according to faculty members, they and their peers are raising questions about grade inflation, the quality of teaching fellows, course sizes, and differences among the College’s academic departments. Dean of Undergraduate Education Jay M. Harris, for example, said that “the student obsession with grades” and “the way we fund graduate students” continue to be prominent conversation topics. Damrosch, for his part, spoke about the value of capping Gen Ed courses to make for what he called a better academic experience. “I, in particular, feel that class size is really, really important and that what we do not need is courses with four or 500 people,” Damrosch said. Reassessing departmental priorities also features into the discussions, said Philosophy Department chair Sean D. Kelly, who chairs the committee tasked with reviewing Gen Ed. Some departments’ desires to attract greater numbers of students, for example, have overshadowed the Gen Ed program’s founding educative principles, Kelly said. History professor Niall C.D. Ferguson at the meeting shared his contempt for the current Gen Ed program as symptomatic of his cynicism toward aspects of undergraduate academics. In an interview, Ferguson said he sees "a system that encourages undergraduates" to take easy courses for their GPA. “I just think that’s really deeply wrong," he said.